If Niagara Falls is on your bucket list (and even if it isn’t) planning to visit Niagara Falls from Toronto as a day trip is a great way to see one of the world’s most photographed sites. There are a couple of ways take on the 137-kilometre (85 mile) journey – by car on your own, on a tour bus, by train on VIA Rail or on a Greyhound or Megabus. Each of them are tailored to different types of travellers and will suit different time frames. 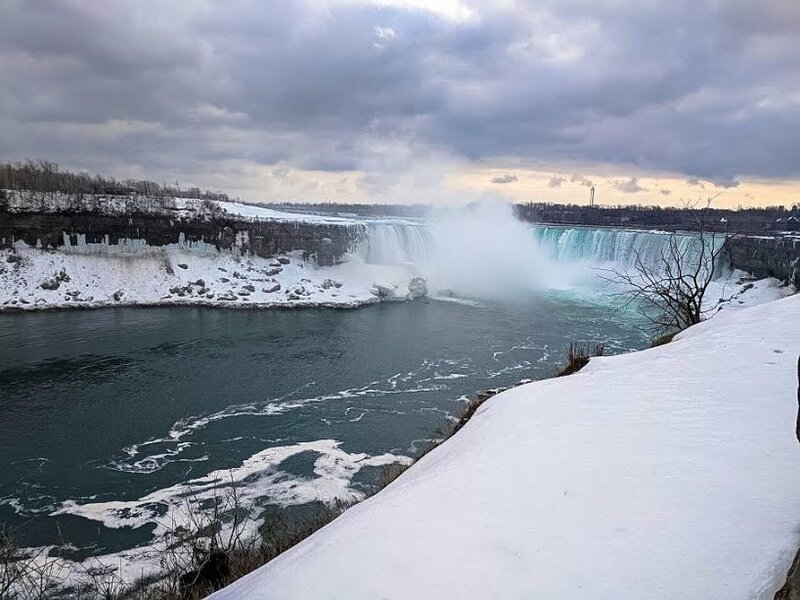 Why visit Niagara Falls in Winter? If you plan to visit Niagara Falls from Toronto for a day trip, the bus tour or rental car will be your best bet. You can also catch the train, but according to the online schedules, it seems to run the almost 2-hour trip once in the morning, departing Toronto at 8.20AM, and once in the evening, leaving Niagara Falls at 5.45PM. So it may not be the most convenient method of getting to the falls, especially if you’re visiting in winter (like I did). There are a few different tour bus companies that run services to and from Niagara Falls, usually with a couple of side-trips thrown in for good measure. 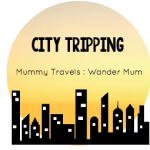 This is not a sponsored post, I’m not getting any kickbacks for this and the company doesn’t actually know that I’m writing about my trip with them. But for the sake of your own knowledge and comparison, I went with King Tours. This tour experience was slightly different to others I’ve had in the past. 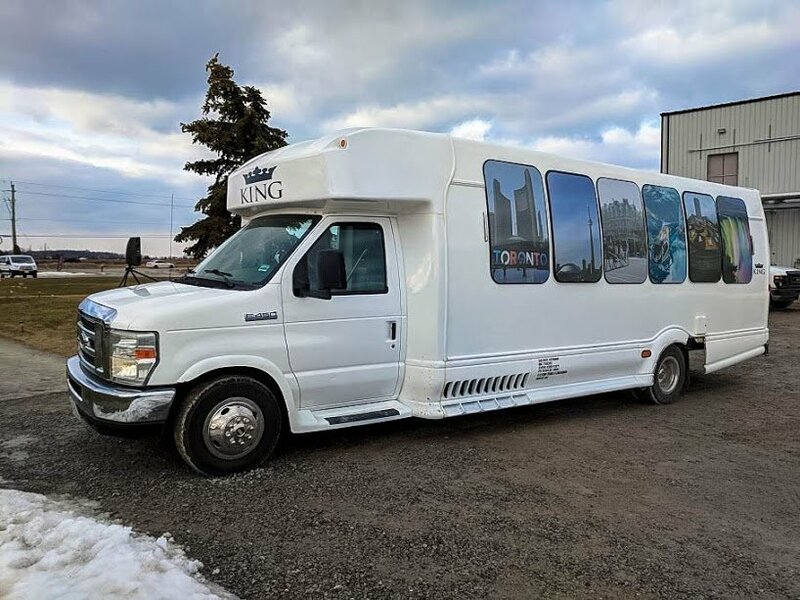 King Tours picks up from a variety of hotels and hostels across Toronto, but they didn’t pick us up in the bus we were travelling in. It makes sense, since the city is so spread out, and picking up everyone on the way out of the city just isn’t feasible when it comes to time management. So I was picked up by a town car, along with a couple of other people from the same side of the city, and we were dropped at the King Tours office in the Garden District. You can pay for the trip there if you haven’t done so online already. The other great thing about the King Tours bus was it had free WiFi. Very handy if you’re travelling internationally. Once everyone’s been picked up and deposited at the office you all clamber onto a bus (ours was a smaller type) and you’re off with a driver who explains a bit of history along the way. I know what you’re thinking. Who travels to Canada, one of the coldest countries in the world, during the coldest season? It seems like a foolhardy thing to do, especially when it’s such a popular place to visit in the summer months. But that’s precisely it. It was busy enough during winter with snow on the ground and ice on the water leading to the falls. I can’t even imagine what it’s like during peak season, I’m really not sure that you’d see much at all. I don’t know about you, but large crowds tend to frustrate me, and I get fed up with a place much quicker if I have to battle with crowds and patiently wait for 100 other people to take their Instagram photos before I can stand in the exact same space for the exact same shot. 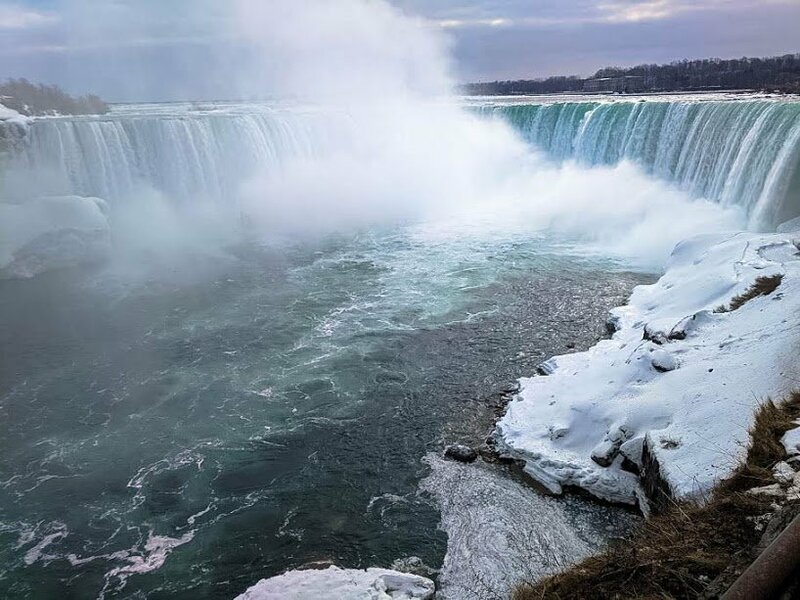 Sure, there aren’t any cruises that you can go on during the winter months but there are a few ways to see the falls up close from water level if you really want to. And there’s the added bonus of not having to worry about getting your sea legs first. I’d made a friend on the two hour bus ride to the falls. Or rather, I’m rubbish at making new friends on tours since I’m always falling asleep or listening to music, so to be fair, she made all of the effort. Since Mr M was busy working and not with me on this trip, she was welcome company. Plus she was an Aussie who’d been living in San Diego for a while, so it was pretty fortuitous that we ended up sitting next to each other. Our scarves acted as mufflers, we gloved up and put on our warmest jackets (it really wasn’t so bad, although we’d managed to be in Toronto during a particularly cold snap that February. Our driver dropped us off close to Horseshoe Falls, aptly name for the shape that the waterfall takes. It was around 10am and we made a beeline for the first attraction that’s open during the winter months – Journey Behind the Falls. On the shore across from Three Sisters and Goat Island you’ll find the Journey Behind the Falls building. During the warmer months you can head down 38 metres (125 feet) to an observation deck where you can look up at Horseshoe Falls. The water travels at 65 kilometres per hour over those falls and thunders down into the Niagara River. You even get an elevator ride down to the viewing portal, which I really recommend doing. During winter you can still descend those 13-storeys down to viewing portals below – boarded up to keep you as warm (and dry) as possible, but with viewing windows for you to experience the stalactites of ice hanging from the cliffs and rocky outcrops. That’s aside from the amazing amounts of water crashing down to the sides of you. When we visited, snow covered the cliffs and rocks as well, making the blue-green water even more of a magical sight. Journey Behind the Falls is open between 9am and 5pm during winter and 9am to 8pm in the warmer months. Ticket prices vary depending on the packages you choose. We doubled back for a look at Horseshoe Falls next, and had a great time watching people climbing on stone fence posts for the “perfect” shot, and clambering to the see the falls from every possible angle. If you’ve never been to Niagara Falls before and don’t know much about it, you might be surprised to learn that it’s the collective term for three falls on the same river. 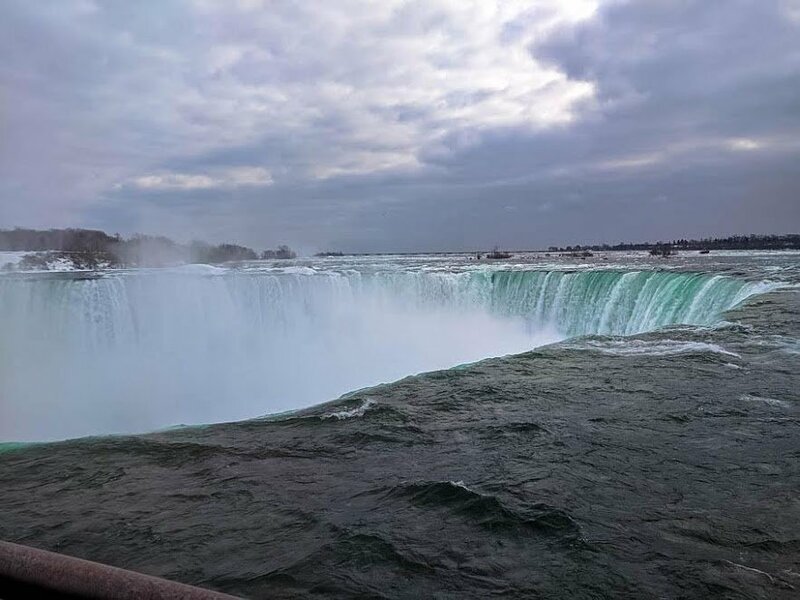 Even on an overcast, cold day in February, Horseshoe Falls will take your breath away. Horseshoe Falls is also known as “Canada Falls” since it’s viewable from the Canadian side of the border. It’s also probably the most spectacular (but I’m biased since I don’t think I’ve seen the other two). It’s the largest of the three waterfalls, with water dropping 51 metres into the Niagara River. About 90 per cent of water from the Niagara river tumbles over Horseshoe Falls. 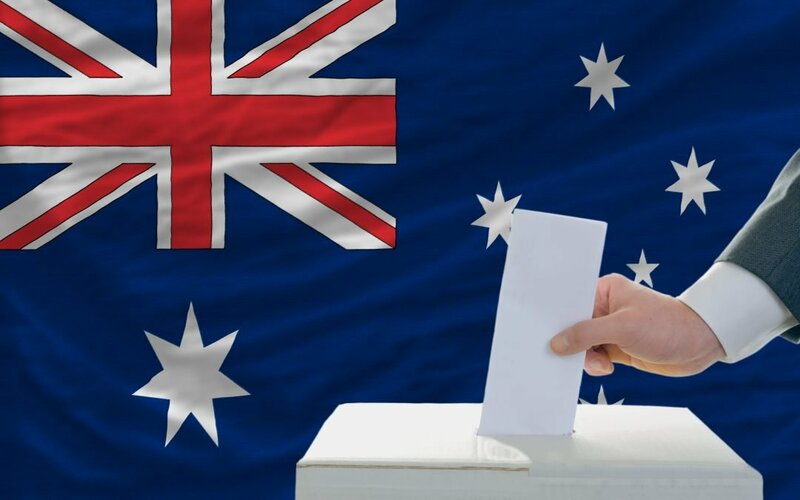 The American and Bridal Veil falls get the remaining 10 per cent. The International Rainbow Bridge connects Ontario and New York. Opposite Horseshoe Falls, you’ll be able to see the International Rainbow Bridge in the distance. 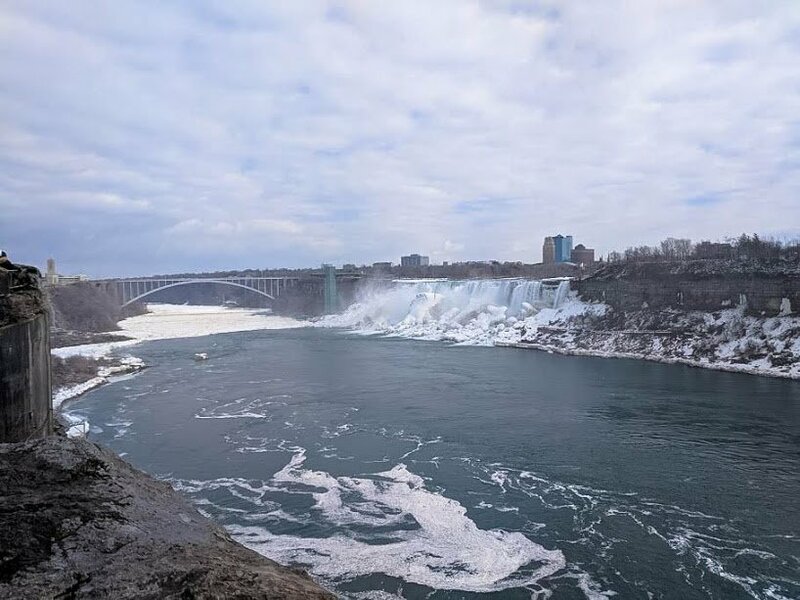 It arches 400 metres across the Niagara River, connecting Ontario and New York. The bridge was built when an earlier one, known as the Honeymoon Bridge, collapsed in 1938. The new bridge was officially opened in 1941, despite World War II raging in Europe and other parts of the world. Both the United States and Canada were part of the Allied war effort. Annoyingly, the origin of the bridge’s name isn’t known, although it’s thought to be taken from a quote in the Bible book of Genesis, which mentions a “bow in the clouds”. The combination of all of that walking and the cold made us hungry, so we went off in search of lunch and found a tourist town that was full of chain restaurants designed to capture tourist dollars. 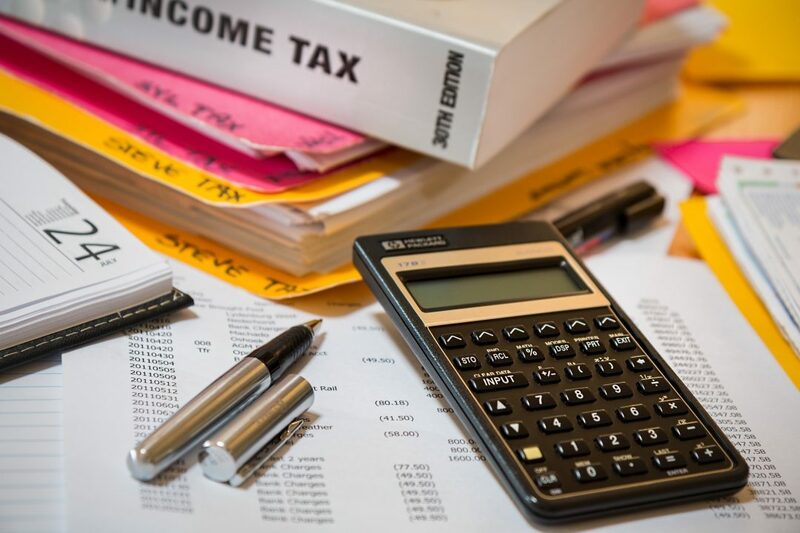 There’s no shortage of places to suit a diverse set of needs – from family restaurants to sports bars, pubs, fast food chains and food courts. Even if I wasn’t hungry, there was no way I was leaving leftovers. We traipsed up the hill to what I thought was a mall, but Google says is a casino, and had lunch at Canyon Creek Restaurant. It’s got a great view of Horseshoe Falls and also the surrounding town. Plus the food was pretty stellar. 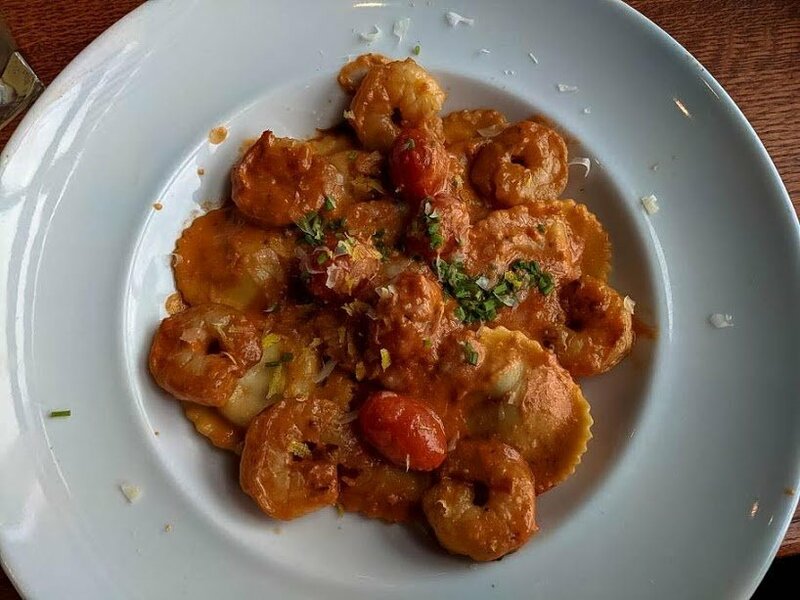 I had the garlic shrimp ravioli and a Moscow Mule to celebrate finally visiting a natural wonder that had been on my bucket list for a long while. After meeting our driver and hopping back on the bus, we took a short trip up Niagara Parkway to check out the Niagara Whirlpool. During the warmer months you can take a Whirlpool Aero (cable) car on the kilometre-long journey from bank to bank. At its deepest the whirlpool stretches 38 metres (125 feet) and it’s thought to have been created about 4,200 years ago. The Niagara Whirlpool runs anti-clockwise. Except for when it runs clockwise. How? Good question. It involves eroding escarpments and ancient pre-glacial river beds, and is way too complicated for me to even understand. So if you’re a geology fan, look up the Niagara Escarpment and that should help fill in the gaps for you. The result is that the river swirls anti-clockwise, but if the hydro-electric power plants nearby divert water from the river, the whirlpool can start to spin clockwise instead. 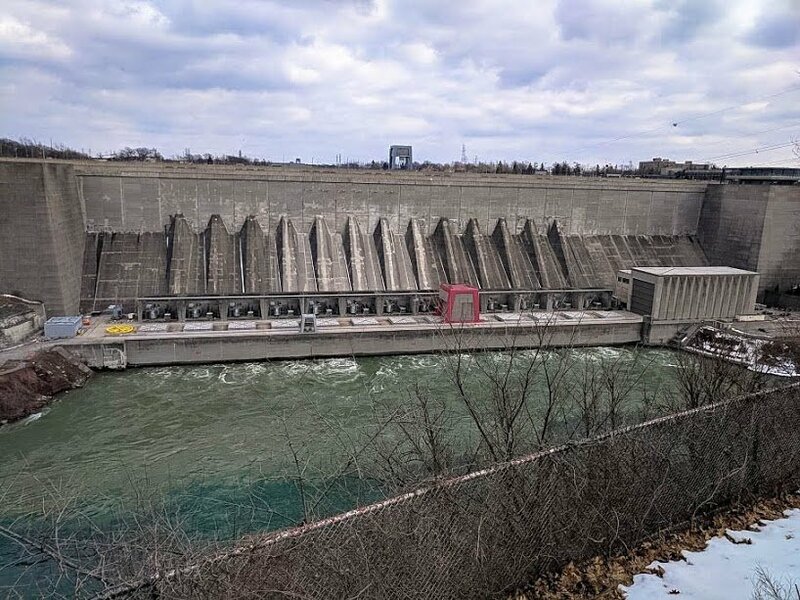 The Sir Adam Beck Hydroelectric Power Station supplies 140,000 homes with electricity. We all jumped back in the bus for the short trip up the road to the Sir Adam Beck Power Station(s). There are two that are almost side-by-side on the Niagara River, and I’m pretty sure that we visited Sir Adam Beck Power Station II. The Hydro-Electric station first started producing power in 1954 when water was diverted from the river in tunnels under the Canadian city of Niagara Falls. The station was re-engineered over seven years in the early 2000’s to help it generate more power. It supplies power to about 140,000 Canadian homes and generates 1499 MW of electricity. The Whirlpool Aero Car is at 3850 Niagara Parkway, and runs during the warmer months. Tickets are $14.55 for adults and $9.45 for children. Think of a quaint British-Columbian town and you’ve probably got a picture of Niagara-On-The-Lake in your mind’s eye. I don’t know what it is about it that strikes me as “British” about it…. it’s probably not at all. But it’s just so beautiful and has such a lovely community feeling that I wanted to stay there to live. 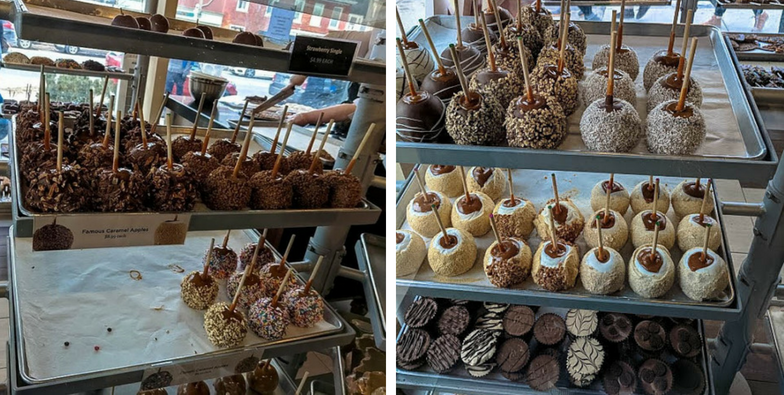 There are so many sweet treats to choose from in Niagara-on-the-Lake. Don’t get me wrong though, it’s definitely geared towards tourists – cafes, ice cream parlours and trinket stores line the main street. And far be it from me to pass up the opportunity to sample a local bakery’s treats. I had a nice cup of tea and a piece of cake served to me by a woman who wasn’t old enough to be my grandmother, but had the charm of a lovely older lady that you just want to hug. Enough of me being creepy though. 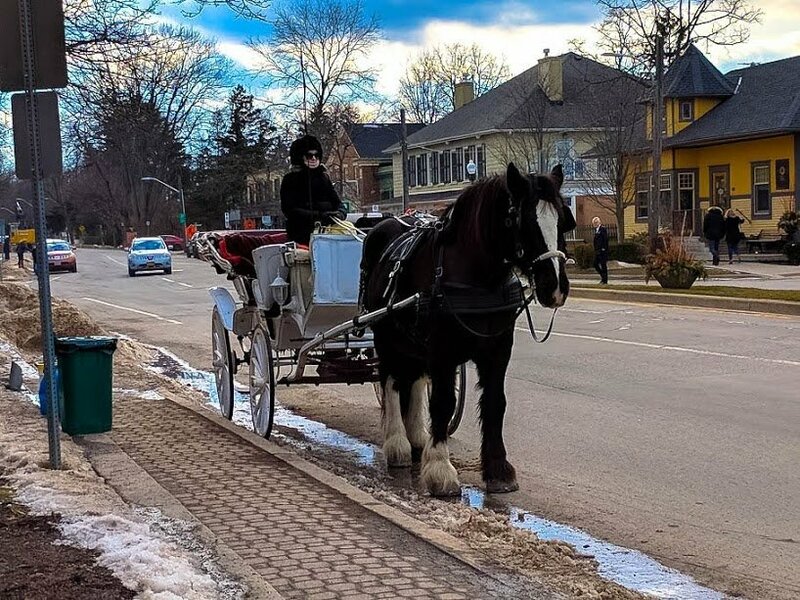 I don’t know who I feel more sorry for – the horse or the driver out in the cold. Niagara-On-The-Lake has a Christmas store, filled with every single kind of decoration that you could think of. They’d make great souvenirs, if you’re looking for something by the way. The town is filled with 19th Century buildings and even in winter you can tell that the greenery would be lush at a more hospitable time of year. Our final stop of the day (before heading back to Toronto) was at Lakeview Wine Company for a spot of ice wine tasting. I’d never heard of ice wine before this trip, but it is definitely suited to my palate. Anything sweet is for me. 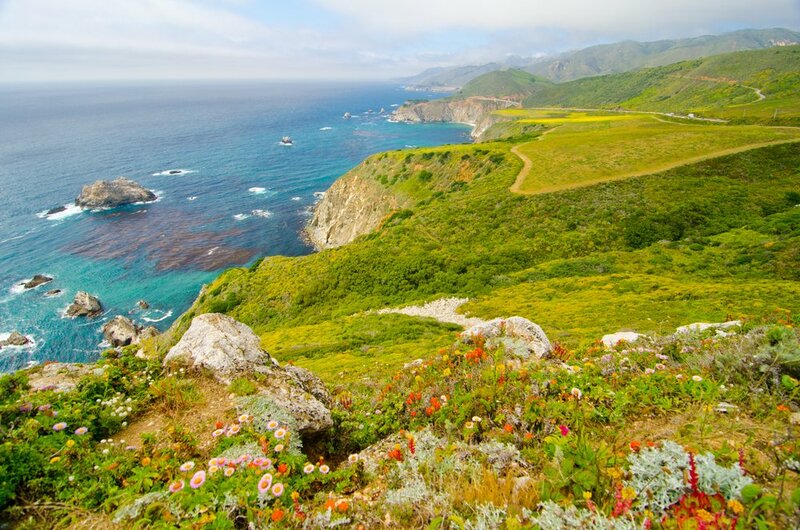 Lakeview produces the full gamut of wine – from reds to rose and over to white wine. But they are especially known for their ice wines, which are confined to colder climates. 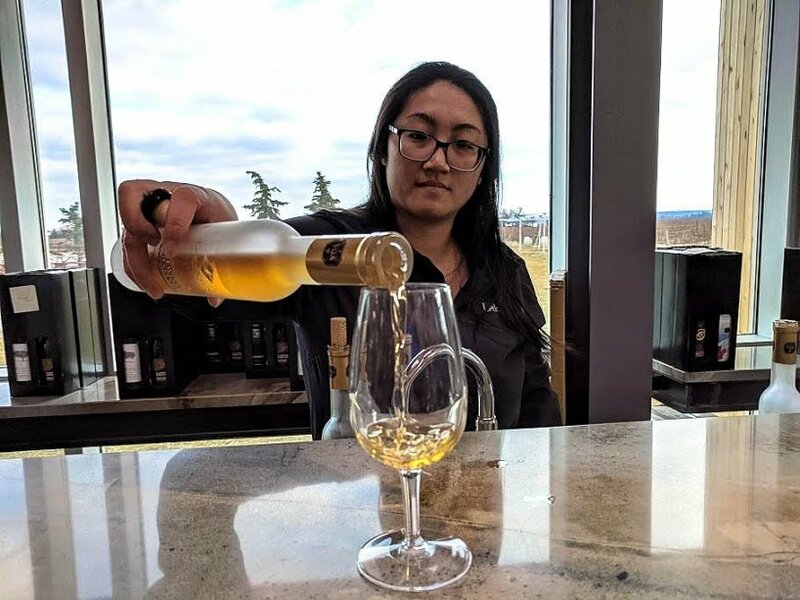 I learned a lot about Ice Wine at Lakeview Wine Co.
Ice wine is all about timing. The grapes need to be harvested when it’s below freezing, around -7C (-20F) to be exact. That means to get a harvest that remains at that same temperature while they’re being picked, they need to be harvested between midnight and sunrise. Not a fun job at all in those temperatures. Then the frozen grapes are tipped into the grape crusher and press. But only 10 to 20 per cent of the resulting juice can be used to create ice wine because of the sweetness content. I feel sorry for the vintners who have to go through that entire process, but the result is pretty spectacular if you’re a dessert-wine lover. 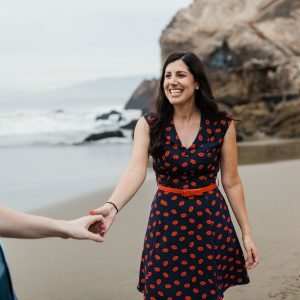 Hi Katherine, great photos! We visitied Niagra Falls from Toronoto about 3 years ago in an October. It was more powerful than I could have imagined. We had a very small tour in fact only 4 of us and our guide was very informative. I also adored Niagra-by-the-Lake where we had a couple of hours to explore. The Falls look magnificent in Winter although it must have been freezing as I was cold when we visited in early October. Have a great week and really enjoyed your post. Amazing photos. Like you I tend to avoid huge crowds & enjoy visiting places in the “off” season. Having said that, the wintry vista added something extra that I don’t think blue skies and crowds could have come close to. That looks like a great trip! I also don’t like visiting in busy seasons (I think that’s half the reason I hated the Vatican) so winter is a good tip. And it still looks amazing. I enjoyed reading your post and lovely photos, Katherine. So glad you got to visit Niagara Falls, Niagara-on-the-Lake, and a winery. I always recommend or take my family or friends who visit me in Toronto there. Wow it looks spectacular! I went to Niagara falls from Toronto about 15 years ago with my family, but we went in the summer. It was BUSY! The snowy backdrop and smaller crowds sounds fantastic! Wow. I think you made a good choice to visit then. Such a spectacle. Amazing sights and sounds too I imagine! Loved the afternoon tea story. I’ve visited in the summer and fall before, but the winter looks amazing! I’d love to see the stalactites of ice you mention. Been twice, but never in the winter… it looks beautiful. I agree with the Niagara on the Lake recommendation too! 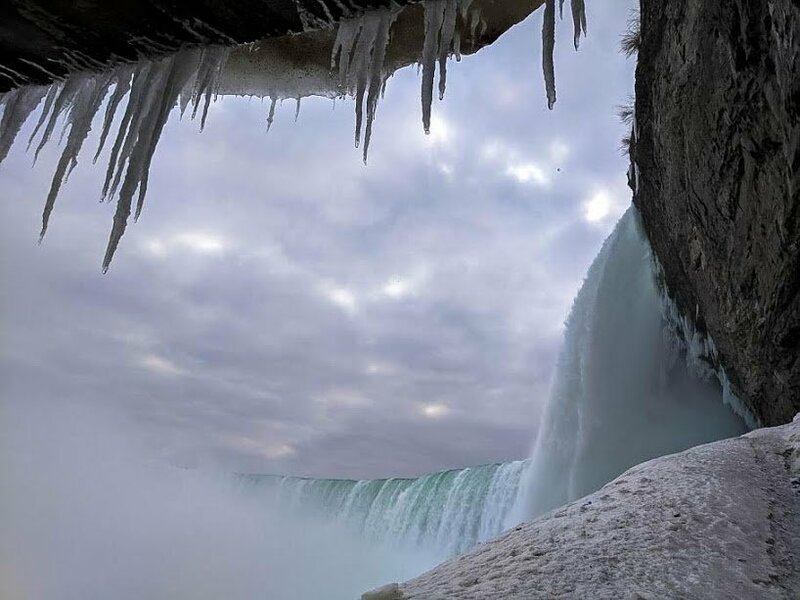 These pictures are stunning – the winter air makes the falls look gorgeous! Also, now I’m craving ice wine and caramel apples, mmm! Wow, this looks stunning during the winter!! I wouldn’t be opposed to see it during hte winter! During the summer I am sure it is packed, liek you mentioned!! Beautiful photos! I have a hard time really enjoying places when they are crowded. 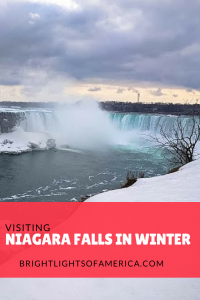 Visiting the falls in the winter and off season sounds like a great idea. I’m a huge fan of winter landscapes and I don’t mind bundling up. I’m sure the scenery was beautiful in it’s winter dress. I love the idea of finding a little bnb in town with a big fireplace and hot chocolate. These photos are absolutely stunning. I would have never thought to have gone in Winter! I really wish I had visited before I moved abroad but I am keeping this for whenever I get back stateside! Niagra Falls is definitely on my bucket list! That tour sounds awesome, I don’t think I’d get to do all those different things if I drove myself I get lost so easily ? I love these views, they are different than the other photos I’ve seen of Niagra Falls. Although it looks very cold, it also looks so beautiful! Ah this has brought back memories. 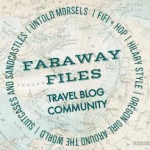 We did a fly drive round Eastern Canada years ago and took a bus tour from Toronto to Niagara. Like you I adored Niagara-on-the-Lake and wanted to live there! We bought a couple of bottles of Ice Wine and carried them round with us for a fortnight before our journey home! Your photos of the falls are incredible! Loved reading about Niagara in the winter. We have travelled to the west coast of Canada for snowboarding. We are looking forward to exploring the east coast but with our girls. I have to admit though I think it will be in the summer 😉 ps…Loved the tour bus! I’ve been to Niagara Falls in September and yes, it was super crowded. It bet it is much more enjoyable in the winter (albeit cold!) I love that you included Niagara-on-the-lake, as I enjoyed that a lot more than Niagara. Much less touristy! I am planning to visit Niagara Falls in the winter of 2020.